In 1929 Tom Heron, the father of the artist Patrick Heron, moved from St Ives to Welwyn Garden City and launched Cresta Silks in Broadwater Road. The architect Wells Coates began his career when Tom commissioned him to design shops in London, Bournemouth, Bromley and Brighton. The work included the Cresta lettering itself. Tom also approached young artists to design fabrics for his new enterprise, such as the artists Paul Nash and Cedric Morris. The company designed clothes for women and textiles. The curtains for the Shakespeare Memorial Theatre, Stratford upon Avon were designed by Cresta and on the Mount Everest ascent of 1939, one of the climbers was said to have worn Cresta pyjamas under his woollen garments. 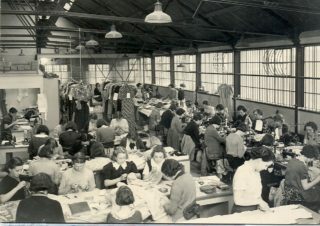 The company left Broadwater Road in 1938, moving to a site adjacent to Howardsgate and again in 1954 the business moved into the Welwyn Department Stores. Debenhams then bought the company in 1957 before Cresta Silk finally ceased trading in 1980. This page was added on 11/05/2009. Welwyn Hatfield Museum Service are planning an exciting Cresta Exhibition early next year. If you have any memories or stories about Cresta in WGC we would love to hear them. We would also like to invite you to visit our exhibition starting on the 10th of February 2019. I worked at Cresta Silks when I left school in 1958, I worked as a finisher and then a machinist. The dresses we made were day dresses that sold in Welwyn Stores for 7 guineas (£7.35) a lot of money as we were earning about £3 a week. I found in my mother in law’s possessions when clearing out her house an Art Deco Cresta Silk cardboard box. It had been used to keep photos. It is quite a sturdy box. The pattern on the box is made out of geometrical shapes. My nan worked at Cresta Silks for years. I remember going into the canteen and having some drink waiting for her to finish. The pictures was right opposite down the passage way. My nan was Ethel Goddard and lived down Longcroft Lane. That’s my mother, Doris Carter, cutter bottom right in photo! I notice a comment from Joan Flay, her great friend. Mum died ten years ago but always spoke of her happy years at Cresta. She always made her own clothes and many of mine as a child. I did not inherit her skills! My first memory of Cresta Silks was when Mr Heron came to my school(Hanside Senior School ) and offered the senior girl pupils an opportunity in his employment. He had just opened his factory in Broadwater Road. Mr Nichol, the headmaster would not let us leave unless he paid us 50d a week! We were employed as ‘finishers’ doing all the hand sewing. I was assigned to Madame Mignod who did special orders. Every morning I tidied all the cutters tables and was general dog’s body for all of them. Miss Crump, later to become Mrs Edwards, was Mr Heron’s dress designer and saw me pinning material on a stand. She requested I worked for her and I never looked back. I became part of the ‘Cresta Family’ and a designer for the company. I worked there for 40 years and have many happy memories. My mother worked for Cresta Silks as an out worker/ finisher. The company would deliver huge bags of garments which needed finishing off with things like buttons and small fastenings or need any hand stitching. I remember visiting the factory when it was in Parkway (where the toy department of John Lewis is now). Tom Heron lived in my road and was the one to point out a greenfinch nest in my front hedge. I knew him when he was retired and loved his spirit.